With a meeting of two very distinct creative minds united by their mutual curiosity in each other’s diverse musical worlds, Guy Buttery and Kanada Narahari bring India even closer to its well-established home in South Africa. They will perform at the Hexagon Theatre Dive in Pietermaritzburg on April 20, 2018. 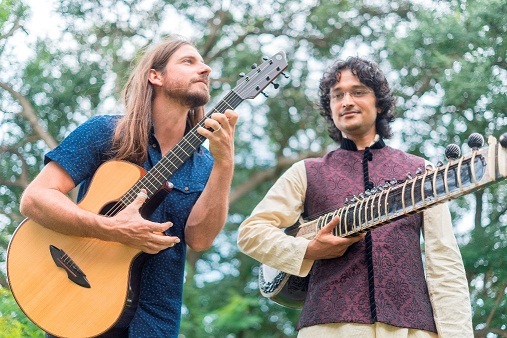 The fusing of music from both of these rich and varied musical backgrounds is rooted in Buttery and Narahari’s progressive exploration of these worlds bridging the gap, as well as re-imagining the realms between Africa and India. Dr Kanada Narahari was born in a small village along the Western Ghats in Karnataka, India. When he was just nine years old, he enrolled to study Carnatic classical vocal and began to develop an interest in Hindustani Classical music with a particular passion for the sitar. In his early 20’s, he found solace at the feet of his mentor and teacher, Pandit Sanjeev Korthi. Whilst this powerful musical journey evolved, Narahari qualified as an Ayurvedic Doctor with a degree in BAMS. This then allowed him to experiment with the healing properties of Classical music which he began to infuse into his therapeutic practice. Today, he is widely regarded as a prominent music therapist and has evolved into a highly accomplished sitar player performing throughout India, Nepal and South Africa. “Guy Buttery is something of a National treasure”, says South Africa’s leading newspaper The Mercury. As an internationally recognized musician, this multi-instrumentalist enjoys invitations to play sell-out performances all over the globe. However, to simply label Guy Buttery as one of South Africa’s musical phenomenoms would be an injustice. His international role has surpassed merely performing concerts to foreign audiences. It has evolved into one as an ambassador of South African music, inspiring people across the world with his homegrown style at the very heart of his talent and tenacity. In 2018, Guy received the highest accolade for a musician in South Africa and was awarded the Standard Bank Young Artist Award. In almost four decades of honouring artists throughout the country, this was the first time since its inception that the award was presented to a musician outside of the classical realm. Together, Kanada Narahari and Guy Buttery bring a newfound gathering of these worlds creating something uniquely their own whilst simultaneously drawing from their respective traditions. Expect high dynamics, delicate African-Indian inflections and virtuoso string playing of an entirely new order.